If you would like to spend time with us at the Habitat ReStore, please register as a volunteer online or contact Landis Griffin, our Volunteer and Construction Coordinator. VOLUNTEER WITH US TODAY. Visit our Calendar to sign-up as a volunteer for upcoming builds in the spring (March – May) or fall (September – November). At other times, register here as a volunteer. Community volunteers like you are not only welcome, but essential – no matter what your construction experience or skill level may be. Habitat’s construction manager oversees the construction site and will decide each volunteer’s job based on daily needs and individual skills. If you want to learn a new skill, just let us know. We’ll show you how. General Construction: Building teams can use anyone at any skill level, from beginner to expert. Skilled Tradespeople: Experienced electricians, plumbers and carpenters are especially needed. Painting and Landscaping: Volunteers aged 14-15 can help on painting and landscaping days. Ages 16 and up are able to help with general construction, some limitations may apply. Minors are not allowed to use power tools. Sign-In: Help construction volunteers sign in at the construction site. Lunch for Volunteers: Provide food and drink for other volunteers, with your group or family. Clerical Volunteers: Serve in the office as a receptionist. Interested in volunteering? Register online or call the Habitat office at 256-340-9609 for more information. See Habitat’s two subdivisions where we build. Questions? Check out our Construction FAQs. From merchandisers to brainstormers to construction educators, you can find your place at the Habitat for Humanity ReStore. Find out more about volunteer roles on the ReStore page. If you would like to spend time with us at the Habitat ReStore, please contact Volunteer Coordinator Landis Griffin at 256-340-9609, ext. 222. 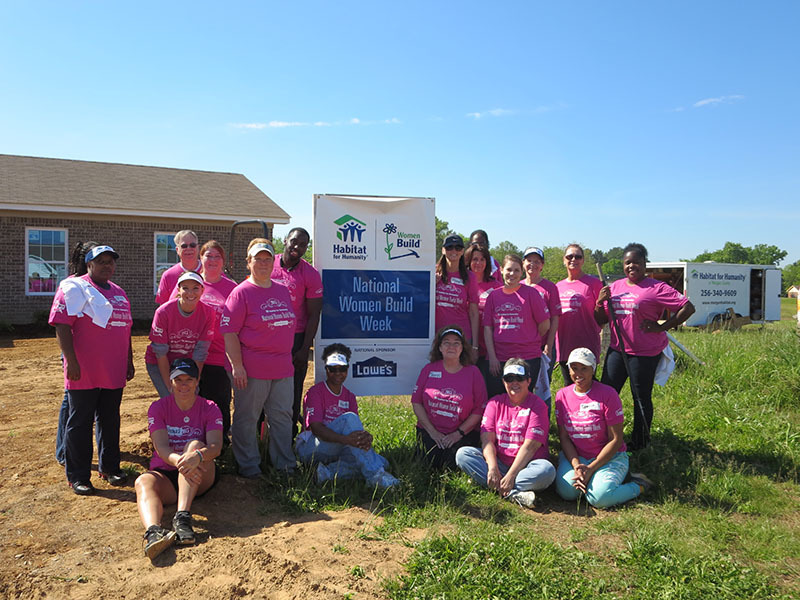 Whatever your passion, there’s a place for you to volunteer at Habitat for Humanity of Morgan County. We’re always looking for bright minds, fresh ideas, and inspired individuals! The construction committee creates workable house plans, oversees build schedules, works to procure in-kind materials and services, and establishes contacts in the building community. This committee works with prospective homeowners from the application phase through the interview phase. This group makes recommendations to the board of directors who then makes the final decision. Finance Committee provides oversight to the affiliate, working with the financial manager and board treasurer to ensure the policies and procedures established by the board are implemented. Public education and awareness programs are important to our fund-raising efforts. Volunteers help plan and execute several key events each year. The ReStore Committee provides support to the retail arm of Habitat, working with the store manager on ideas for marketing, material donation sources, and growth opportunities. This ad hoc committee is activated when Habitat for Humanity of Morgan County begins the search for land for a multi-home development. To find out more about any of these volunteering opportunities, please contact Volunteer Coordinator Landis Griffin at 256-340-9609, ext. 222. Would you like us to add you to our mailing list?